Sport Lisburn & Castlereagh has paid tribute to local sporting talent during the 2018 Draynes Farm Sports Awards held at a prestigious ceremony at Lagan Valley Island, Lisburn. The event, which was attended by over 200 guests, was hosted by Sports Journalist, Thomas Niblock and included an in depth interview with Women’s Hockey World Cup Silver Medallist and Captain of the Ireland Team, Katie Mullan. The Sports Awards recognise both individuals and teams from Lisburn & Castlereagh who have excelled in their chosen sport as well as individuals who have contributed to sporting success through coaching or as Club administrators. The aim of the event is to celebrate the immense sporting talent within the Council area and encourage greater participation in sport. Golfer, Paula Grant was named Sports Personality of the Year. This year, Paula was selected to play for Great Britain and Ireland in the Curtis Cup, which is the female equivalent to the Ryder Cup, making her only the 6th representative from Northern Ireland in the past 86 years to have achieved this prestigious honour. Her steadfast performances throughout the year led to this selection, placing Paula as the highest ranked Irish player in a number of tournaments. Gold Medallist in the World Masters Athletes Event and Irish record holder, Kelly Neely was awarded second and Irish Downhill Champion and World Downhill Masters Champion, Colin Ross third place in this category. Due to the overwhelming number of nominations this year, the Junior Sports Personality of the Year was divided into two age categories, under 15 years and under 19 years. The U15 category was won by 12 year old table tennis star, Sophie Earley who had an unstoppable 2018, emerged victorious in a number of tournaments all over Ireland, including achievements at senior level. Sophie also was the only European representative in her age category to compete at the prestigious World Cadet Challenge in Japan. Second place in the U15 category was presented to Judo Gold Medallist and multi-sport athlete, Lloyd Andrews and third place was won by Cathal Brugha Water Polo Club goal scorer and Silver Medallist, Eva Ramsay. The U19 Junior Sports Personality of the Year title was won by fencing and multi-sport athlete, Charlotte Slater who enjoyed a tremendous year, becoming the national champion in fencing for the third consecutive year and ranked number one at U17 and U20 level. Charlotte also played for the developing St Patricks Senior Ladies Gaelic Football Team and she represented the Northern Cricket Union as well as gaining international caps in netball. Second place in this category was awarded to the Junior Giants Ice Hockey Captain and U18 GB women’s ice hockey team representative, Kaitlyn Morrison while third place was won by school hockey captain and Ireland and Ulster U18s representative, Andrew Edgar. 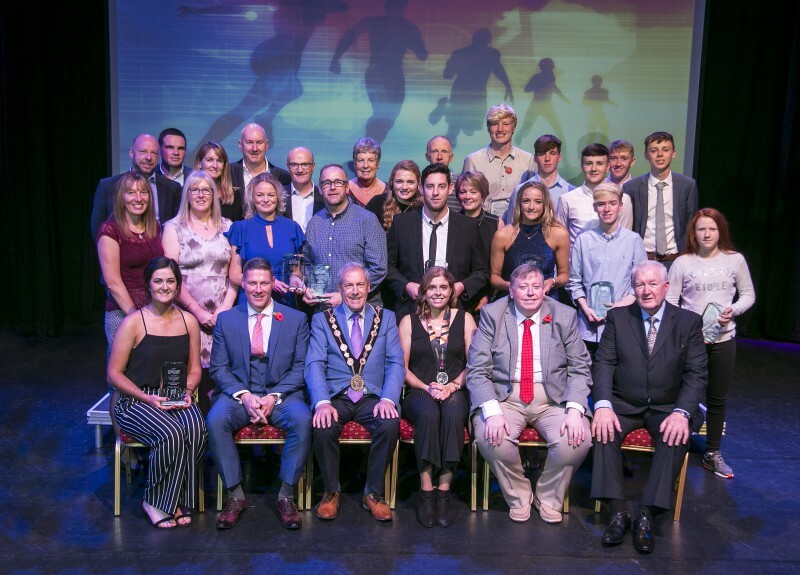 Speaking at the awards ceremony, the Mayor of Lisburn & Castlereagh City Council, Councillor Uel Mackin said, “It is a great honour to attend the 2018 Draynes Farm Sports Awards and publically recognise the wealth of sporting talent in Lisburn & Castlereagh. “A wide range of sports are represented across all nominations, which highlights the diversity of sport within our Council area and the opportunities that are available to the local community to get involved in sport or try a new activity. Alderman Paul Porter, Chairman of the Council’s Leisure & Community Development Committee added, “Lisburn & Castlereagh has a proud history of sporting success producing many World, Olympic, Commonwealth, European and National Champions. The Council has endeavoured to support these teams and individuals who aspire to reach the highest levels of performance and competition but they also aim to encourage greater physical activity in the wider community by delivering programmes to help those wishing to improve their fitness or take part for the fun and enjoyment of sport. “Within Lisburn & Castlereagh, the Council takes pride in providing first class facilities for visitors and athletes such as Lagan Valley LeisurePlex and Dundonald International Ice Bowl. It also offers a varied programme of activities through the Council’s Sports Development Unit such as the highly popular Lisburn Half Marathon, 10k and Fun Run, which attracts over 6,500 participants per year, as well as the successful Every Body Active 2020 programme which helps people take their first steps on the road to physical activity. Club of the Year was won by Jog Lisburn Running Club with Simply Judo taking second place and Ballymacash Rangers Football Club third place. School Team of the Year was awarded to Wallace High School Second XI Boys Hockey Team with St Patrick’s Lisburn Year 9 Football Team taking second place and Laurelhill Community College U14 Athletics and Cross Country Team securing third place. Adrian Daye from Jog Lisburn Running Club was presented with the Coach of the Year Award for his hard work and dedication developing the club. Second prize was awarded to Adam Louden from Lisnagarvey Ladies First XI Hockey Team and third place Ciaran McGurk of Cathal Brugha Water Polo Club. The Senior Team of the Year was won by Lisnagarvey Ladies First XI Hockey Team with Lisburn 2Gether Special Olympics Club taking second place and Lisburn Golf Club Senior Team third place. Lisburn Golf Club, Fred Daly U18 Team was awarded first prize in the Junior Sports Team of the Year. ICAN Judo Club Youth Team achieved second place and Lisburn Rangers Girls U15 Football Team a third place. The Merit Award was presented to four individuals to recognise the essential and valuable service they provide to their clubs in the pursuit of success in their chosen sport. The Junior Award was achieved by James Nicholson from Carryduff Taekwondo Club while the Senior Merit Award was awarded to Michael Tiffen from Lisburn Taekwondo Club, Stephen Gilmore from Lagan Valley Orienteering Club and Ronnie Smyth from Annadale Hockey Club.